On the face of it the company of a quartet of hairy Americans who specialise in heavy rock covers would appear to be odd place to spend a Friday evening. 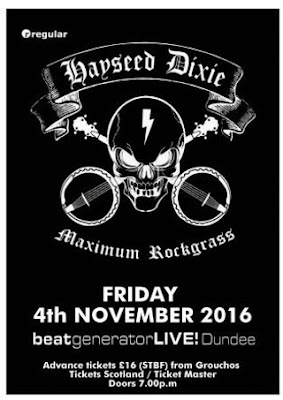 But of course Hayseed Dixie (a not particularly subtle pun on AC/DC) approach things from a rather unique angle, armed only with acoustic guitars, banjos, mandolins and fiddles, plus a four string acoustic bass. And have succeeded in creating some odd metal/hillbilly hybrid which the band have termed “Rockgrass”. They arrived on the scene way back in 2002 with their release A Hillbilly Tribute to AC/DC. One may have though such a niche market unlikely to sustain this sort of stuff beyond a single novelty item, but 2016 finds the band (albeit having gone through a veritable Somme Offensive of members) out and about promoting their 14th release album; this one featuring the boys' giving the Hayseed treatment to the likes of Comfortably Numb, Don't Fear the Reaper and Eye of the Tiger. Although only the last named was aired this evening. I freely acknowledge that hard rock is not my oeuvre, so was unfamiliar with a deal of the set, but I did recognise the AC/DC tunes Dirty Deeds Done Dirt Cheap (which opened the show), Highway to Hell (which closed it) and You Shook Me All Night Long. Motorhead's Ace of Spades was in there too, as was Black Sabbath's War Pigs. But perhaps a factor in the band's longevity is that they (rather in the manner of The Ukulele Orchestra of Great Britain, when I think about it) have spread their net far and wide musically speaking. Thus is was Bohemian Rhapsody, the Allegro from Mozart's Eine Klein Nachtmusik, Bob Marley's Buffalo Soldier and – most incongruous of all, in my opinion - Marvin Gaye's What's Going On made appearances. Not everything hit the mark, I have to say: I shall just write the words “Eternal” and “Flame”, and leave it at that. Perhaps a less striking choice – indeed, one might suggest to to be almost obligatory - was an barnstorming rendition of Dueling Banjos. The quarter are plainly first-rate musicians, although clearly understand the need for a dollop of ironic humour when serving such fare. Front man John Wheeler – self styled inventor and sporter of “the skullet” (a mullet for those who have lost a bit on top) – really does have a an excellent line in comedic timing. So, although the evening was generally a fun one, unfamiliarity on my part with many of the songs led to little yawns creeping in at times. For I felt the Rockgrass musical joke was not really one which one could press out for a full hour and a half. The band's approach to dealing with some of the slower passages in their covers generally appeared simply to play as fast and furiously as they could. Bewilderingly so, at times. As a rule fast playing is generally good, but generally not as good as good playing. Although to be fair, for the most part, the Dixies achieved both. The band are still touring the UK until November 14th, and I recommend catching them – unless you are congenitally allergic to banjos or mandolins played at 100mph.